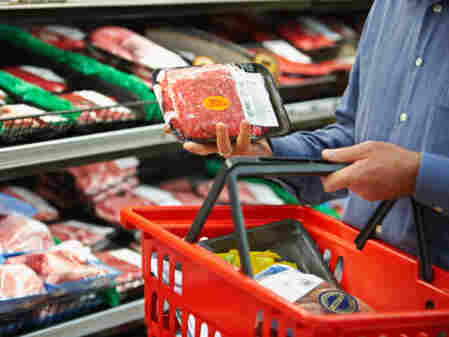 1 In 4 Supermarket Meat Samples Tainted With Drug-Resistant Bacteria : Shots - Health News A survey of meat and poultry sold in supermarkets across the country found widespread contamination with Staphylococcus aureus contamination — the cause of most staph infections in people. A quarter of the samples were tainted with bacteria resistant to antibiotics. Consumers may be weary of hearing about what's wrong with their meat — from the calories to the E. coli to its heart unfriendliness. Unfortunately, there's another bit of bad news: Nearly a quarter of the meat and poultry sold in U.S. supermarkets is infected with nasty drug-resistant bacteria, too. That's according to researchers at the Translational Genomics Research Institute. They took samples of meat and poultry around the country and found that 47 percent had evidence of Staphylococcus aureus contamination. More than half of the bacteria they found were resistant to at least three classes of antibiotics, according to the study, published online today in the journal Clinical Infectious Diseases. "For the first time, we know how much of our meat and poultry is contaminated with antibiotic-resistant Staph, and it is substantial," Lance B. Price, senior author of the study and director of TGen's Center for Food Microbiology and Environmental Health, said in a statement. There are more than 30 types of Staphylococcus, but Staphylococcus aureus causes most staph infections in people, including skin infections and food poisoning, according to the National Institutes of Health. The drug-resistant strains found in the meat and poultry samples are especially difficult to treat because they've evolved beyond the regular arsenal of drugs that kill them. The researchers say that most Staph found in meat can be eliminated by cooking food thoroughly, but it can still pose a risk to consumers if handled unsafely or if it cross-contaminates with other things in the kitchen. Another problem: S. aureus isn't among the four types of drug-resistant bacteria the U.S. government looks for when it surveys retail meat. The researchers suggest that we need a better inspection program to help track the presence of the bug. Antibiotics used in the livestock sector have been generating particular concern of late. According to an analysis of government data by the Center for a Livable Future at Johns Hopkins School of Public Health, almost 80 percent of the antibiotics sold in 2009 were reserved for livestock and poultry. The U.S. Centers for Disease Control and Prevention has said that "there is strong scientific evidence of a link between antibiotic use in food animals and antibiotic resistance in humans." The Clinical Infectious Diseases study was supported through a grant from The Pew Charitable Trusts as part of the Pew Campaign on Human Health and Industrial Farming.